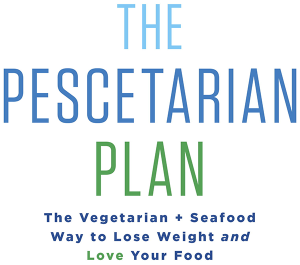 The Pescetarian Plan may well be the most flexible, wallet-friendly, practical—and of course ultra-healthy and delicious—way of eating you’ve ever encountered. Using the Seven Pescetarian Principles in the book, you can create your own meals. Or, you can follow the book’s wonderfully tasty meal plan, set at four different daily calorie levels: 1,500, 1,700, 2,100 and 2,500. It’s a smart thing to do if you’re feeling out-of-control around food or just need a little help with portions and nutritional balance. Here’s a two-day plan, using meals and recipes from the book; some of the recipes are on this site. As with the meal plan in the book, you can “mix and match”. For example, you can have Day One’s breakfast and lunch with Day Two’s dinner, snacks and treat. That’s because, in The Pescetarian Plan all the breakfasts are the same number of calories, the lunches have the same calorie count, and ditto for dinners, snacks and treats. Meaning, you can enjoy this diet for a long time! It also means that, by choosing your own meals and creating your own meal plan, You can be a pescetarian one day, a vegetarian—or even a vegan—the next. bread for a total of 2 slices of bread. 1,800- AND 2,100- CALORIE PLANS:Same as above, but have a cup of grapes for dessert. for a total of 3 tablespoons of peanut butter. 2,500- CALORIE PLAN:Same as the 1,800 and 2,100 calorie plans, but have two tablespoons of walnuts or other nuts/seeds with your grapes. 2,500- CALORIE PLAN:Same as the 1,800 and 2,100 plan, but end the meal with one large piece of fruit. To the 1,800- and 2,100 plan, add a tablespoon of peanut butter for a total of 3 tablespoons of peanut butter. 2,500- CALORIE PLAN:To the 1,800 and 2,100 plan, add 2 tablespoons of chopped pecans to the cabbage salad.